“Jack and Diane” genuinely feels like the pulse of the heartland of America. You sense that tenfold with the video, which features a ton of Cougar’s old high school photos and videos to give it a vast sense of authenticity. His other songs, even the aforementioned monster hit “Hurts So Good” were just alright for me. Still, I respect the artistry of Cougar (I suppose I should add Mellencamp at some point) and liked this album enough for it to deserve a spot on this countdown. COMMERCIAL SUCCESS: Talk about a commercial breakthrough—not only was “American Fool” one of the most successful albums of 1982 it ranks among the best-selling albums of the entire decade. It took over the top spot on the Billboard Top 200 from Fleetwood Mac’s “Mirage” on September 11, 1982 and remained at number one for nine weeks before finally get knocked off by Men at Work’s “Business as Usual”. Of course, its success came on the strength of two enormously popular singles. “Jack and Dianne” soar to number-one on the Billboard Hot 100 while “Hurts So Good” had to settle for number two. The songs finished 1982 seventh and eight respectively on the year-end Billboard Hot 100. “Hurts So Good” would spend 16 weeks in the Top 10, more than any pop single form the 80s. “Hand to Hold On to” reached 19 on the Billboard Hot 100 while “Thundering Hearts” made an appearance on the Billboard Top Tracks at No. 36. In total “American Fool” has sold more than five million copies. 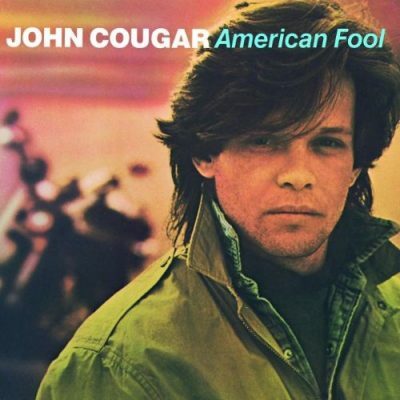 FUN FACTS: Via AXS.com here’s a fun fact about Cougar (Mellencamp—ugh) you may not have known: “Political activism has always been a big part of John Mellencamp’s life and his greatest legacy in that arena is Farm Aid, the longest running benefit concert series in America. Mellencamp co-founded the event in 1985 along with Willie Nelson and Neil Young, with Dave Matthews joining the Board of Directors in 2001. Since the initial concert in Champagne, Illinois, the organization has raised over $45 million for farmers and helped promote causes like getting farm fresh food into local communities.